Fish Sauce Take a pd of anchovies, 1 qart of mushroom catchup 1 quart of port wine, 1 quart of Renish Spirit of Vinegar 2 oz of shalots - one handfull of sliced Horse Radish boil all these together till the anchovies are dissolved then strain it, & add 1 oz of white pepper & 2 sliced nutmegs. Lemon Cheese Mrs Beckett Grate the rind of 2 lemons, & squeeze the juice into a quart of thick cream, sweeten it to your taste beat it at least half an hour to make it as thick as possible without frothing it, put it into a sive the size of your dish, first put a piece of muslin into the sive to take it up by. set it over a dish with some sticks to raise it that the whay may run out it must be made 24 hours before you use it. For Permanent Ink - Mr Hale Salt of Tarter 1/2 oz to two oz of water when this prepration is well-dried upon the linen then mark with the ink prepared by [Lunar?] caustic 1 scraple to 1/2 oz of water Miss B [Headlams?] 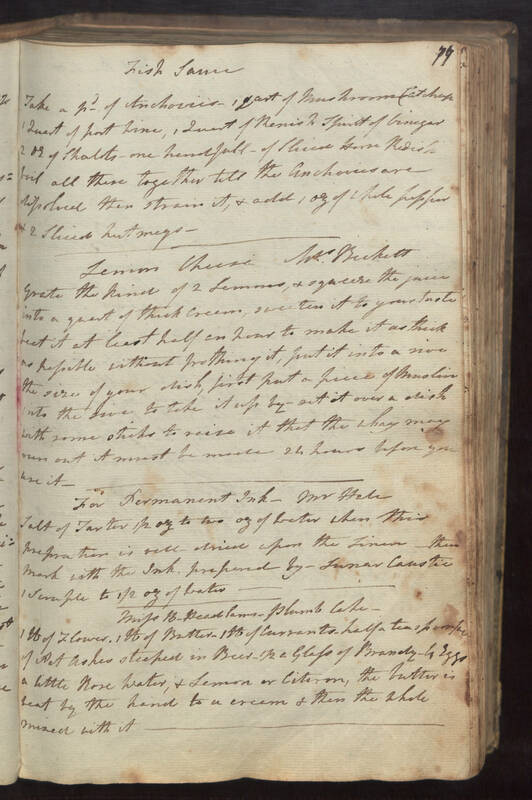 Plumb Cake 1 lb of Flower, 1 lb of Butter, 1 lb of currents, half a teaspoonfull of pot ashes steeped in Beer, 1/2 a glass of Brandy, 4 eggs a little rose water, & lemon or citeron, the butter is beat by the hand to a cream & then the whole mixed with it.